Published 2006-02-08 in sections English, Digital World. Last week, some friends and I played a very exciting and long (6 hours) game of Risk. At the end, I thought: Too bad we can't rewind the game and play it fast forward, just see how the tides of colors are waging. Well, on Sunday, I thought, why not, and started writing "RiskRecorder". It is my first larger project with python and gtk+, and I am quite content with both of them. 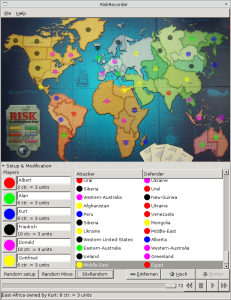 The map is stolen from JRisk, and with that the idea of a gif file that maps pixels to countries. 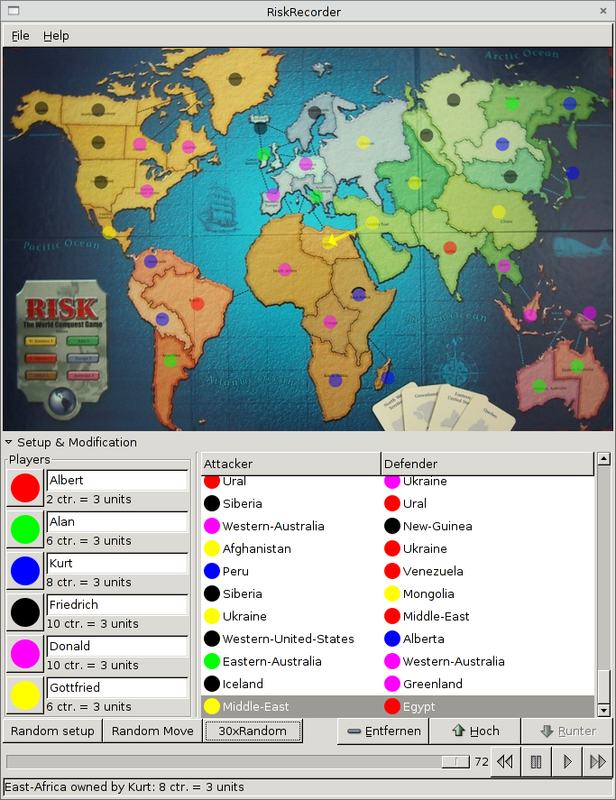 The RiskRecorder is meant to be used during a game of regular risk, to - well - record the moves. As a side benefit, you don't have to calcuate the number of units you get anymore, as the RiskRecorder can tell you that. You can then save the whole game for later review. It should be in a usable state by now, but I plan to add more features sometime, like better animations and graphs showing development of the game. To try it yourself, you need the program itself (one file so far), then get at least the board.map, board_map.gif and board_pic.jpg from the jrisk CVS repository (you can open any other JRisk map in RiskRecorder, too). You might need to download the python bindings for gtk and cairo, too. On debian, I assume that apt-get install python-gtk2 python-cairo will get you what you need. As always, comments, bugreports and patches are welcome. To follow development, have a look at my svn repository. und wann gibts das fürs handy?? WOW, und da sagst du mir immer, dass du keine Zeit hast *fg*. Sehr geil Jo, mach weiter an dem Game ! Naja, ist ja kein Game in dem Sinne. Aber ein bisschen wird sicher noch dran feingeschliffen.